We have a factory farm moratorium bill again this year! Momentum for a moratorium is growing. The number of cosponsors this year has more than doubled. 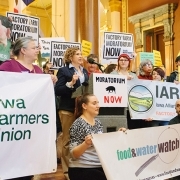 To keep moving the moratorium forward, the Iowa Alliance for Responsible Agriculture, Iowa Citizens for Community Improvement, and Food and Water Watch are jointly organizing a Factory Farm Moratorium Day to lobby legislators to support the moratorium. Iowa is in the midst of a factory farm crisis. Please join us to let our legislators know we need to fix it NOW! 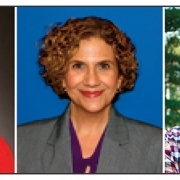 9:30 – 10:00 am – Wallace Building Auditorium. Register and enjoy some hot coffee and refreshments to power up for the day. 10:00 – 10:30 am – Lobby Day Training. Get talking points on the moratorium bills. 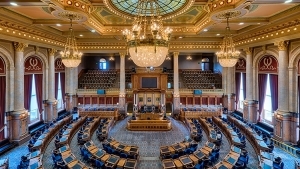 Learn lobbying basics from Iowa CCI’s Adam Mason. Form small groups before heading over to the Rotunda. 12:30 – 1:30 pm – Lunch Break. Enjoy a meal in the lower level State House cafeteria or in several nearby restaurants. 2:30 pm – Enjoy a sing-a-long performance of the Raging Grannies after the press conference concludes. RSVP here to let us know if you can join us. Don’t miss this opportunity on February 21 to send an important message to the Iowa State Legislature that Iowa’s factory farm system is broken and needs to be fixed. It’s time for a factory farm moratorium NOW! Action Alert - Tell Rep. Dean Fisher to Assign the Factory Farm Moratorium Bill to a Subcommittee!